Have you been longing for white smile? Keeping your teeth white all starts with knowing what causes your teeth to become stained, and taking the right measures to do what you can do to remove stains that have already taken hold. It’s easier than you think! Maintaining a brilliant smile starts with monitoring the foods and drinks that can cause your teeth to stain. We can further help you if you need teeth whitening in Lynnfield, but until then we’ve outlined a few simple steps that you can take right away. Did you know you could be contributing towards the discoloration after your teeth? A variety of drinks could cause yellowing of your pearly whites. Do you love beverages like coffee, wine, or dark sodas? Or dark fruit juices like cranberry or pomegranate? Little did you know, all of your favorite beverages that you might indulge in on a daily basis are contributors to teeth stains. There are foods that can yellow your teeth, too. These include beets, berries, tomato sauce, soy sauce, balsamic vinegar, pigmented candy, and dark caramel. If you’re a tobacco user each puff is contributing to discolored tooth enamel. Plus, certain medications can cause yellow teeth as one of their side effects. Even your genetics can make your teeth yellow. Brushing and flossing after a tooth-staining drink or meal will also cleanse your mouth. Plus, flossing will further help reduce plaque that can attract stains. Chewing sugar-free gum can stimulate the production of saliva that could assist in keeping your entire mouth fresher and your teeth whiter. 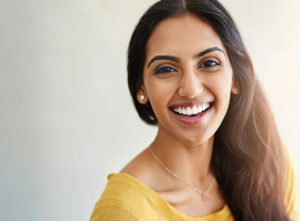 If you’ve been thinking about whitening your teeth, you should really consider visiting Schumacher Dental for teeth whitening. Talk to your dentist in Lynnfield about the whitening procedures we have available both in our office or at home. You’d be surprised at the dramatic results you can see in a much shorter amount of time compared to over-the-counter treatments. Now that you know what causes teeth stains, as well as what you can do to prevent and remove them, you can take steps to keep your smile bright and beautiful. Contact Schumacher Dental for your whitening needs!